View the 24 minute quality film at the blog. Click the link. New edit of Ron Taylor's classic 'first film in color' featuring his girlfriend Valerie Heighes soon to be Mrs Valerie Taylor. 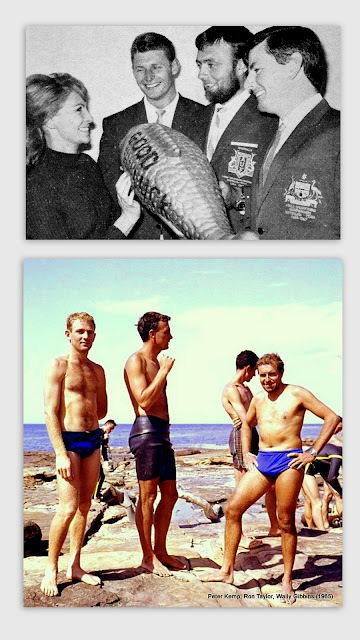 No diving reef rules existed in 1963 - consequently Val often touched the coral. Wally Gibbins rides a turtle 'into the distance' at the end. 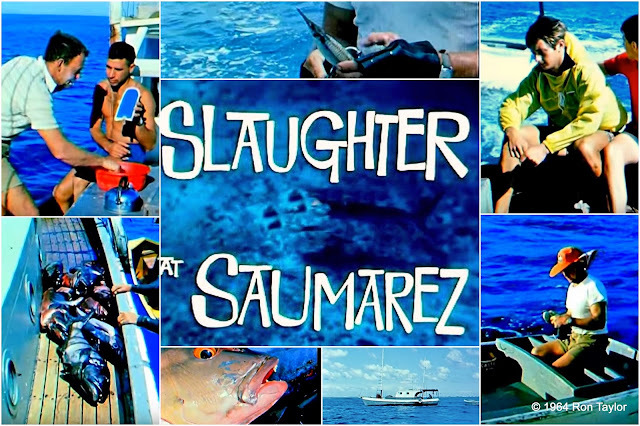 Filmed during the annual November "Skindiving Convention" held at Heron Island, Queensland. A time for spear fishermen and shell collectors to holiday together and exchange information. Underwater photography with medium format Rolleiflex camera with diver Alan Power photographing Valerie with painted crayfish (later called a lobster). 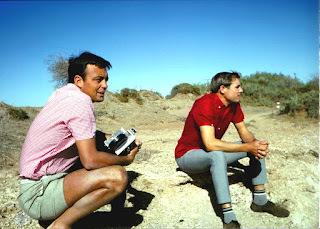 Original footage is on Kodachrome II 16mm stock. The first Great white to be saved by Australian divers - at a time when the species was poorly understood and years before JAWS was written and the movie made. Ron Taylor took a very calculated risk - saving a shark that may have been one of the two (or more) which could have yet did not attack him when he fell into the sea the previous night. An act of kindness being repaid. This footage was re-discovered in 2017 and music added for this memorial to both Ron and the shark he spared. THE CORAL SEA in 1964 "Slaughter at Saumarez"
Filmed by Ron Taylor. No room aboard for a girl so Valerie remained in Yeppoon QLD. This was during early October 1964. 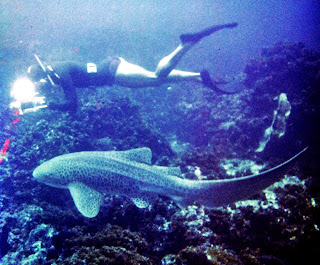 Film was released in theatres one year later as part of a three film programme titled "Ron Taylor's Shark Fighters". Lower panel is a still pictures (only) version from the same trip incorporating part of the film soundtrack. Some pictures do not quite match the commentary - intentional for light humor. "Skindiving Paradise" Ron and Val Taylor at Heron Island QLD in the early 1960s. Winter morning in Sydney. 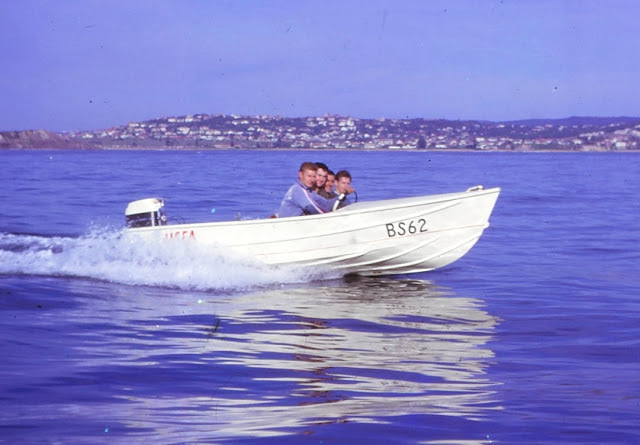 1963 and a group of four White Water Wanderers travel from Rose Bay in Sydney Harbour up the coast toward Newport Reef - in search of clear water. 45hp outboard was considered large at the time. Biggest available was 75 horsepower. A couple of years later this changed with Mercury's 100 HP monster. Wetsuits in 1964 were Cousteau-style, American neoprene, hood-attached no zips. 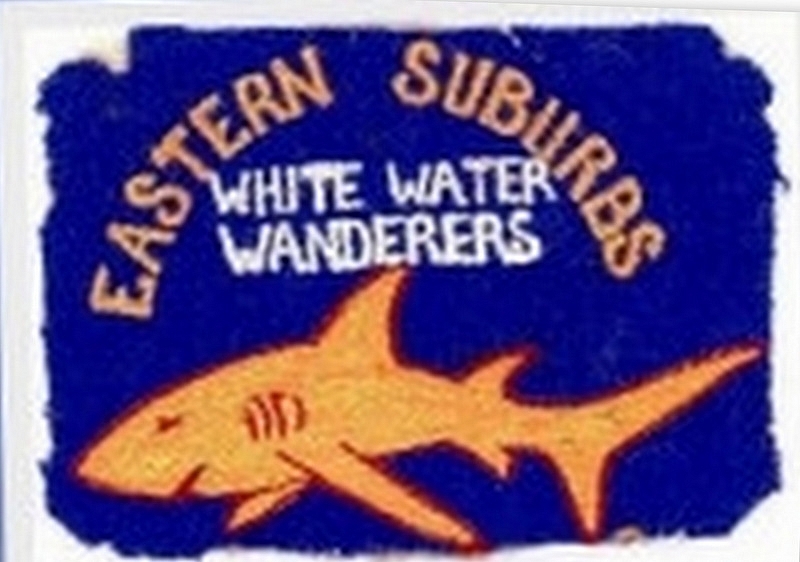 A few remaining former members of White Water Wanderers (Eastern Suburbs club, Sydney) are Vic Ley, Roy Bisson, Ron McEwen and John Gallagher. John Gal (aged 84) lives in Waverley, Sydney. Previously mentioned here, 'Gal' is the guy whose great aunt is on the reverse side of our $10 Australian note (Mary Gilmore). And equally noteworthy was Grace Kelly the movie star and former Princess Grace of Monaco who is one of the Gallagher family cousins. 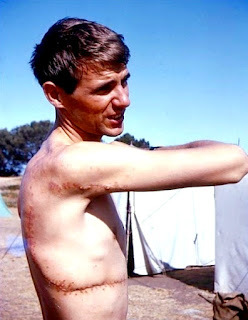 Some diving history which appears not published in Australian Skindivers Magazines -Gallagher remembers (vaguely as it was not directly connected to him) were two accidents that members of the "wanders' sustained in the early 1960s. One incident was a serious shark bite on a member (who quit diving forever after he recovered). 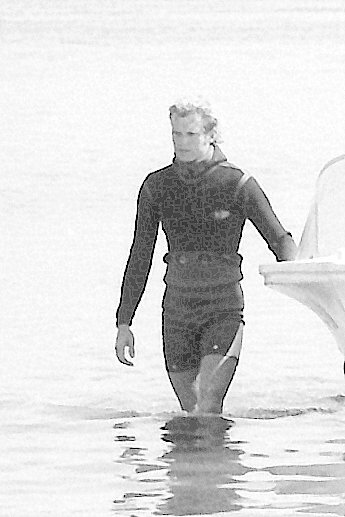 Ron Ible (senior) also told me the story, briefly, as he'd help carry the injured diver. 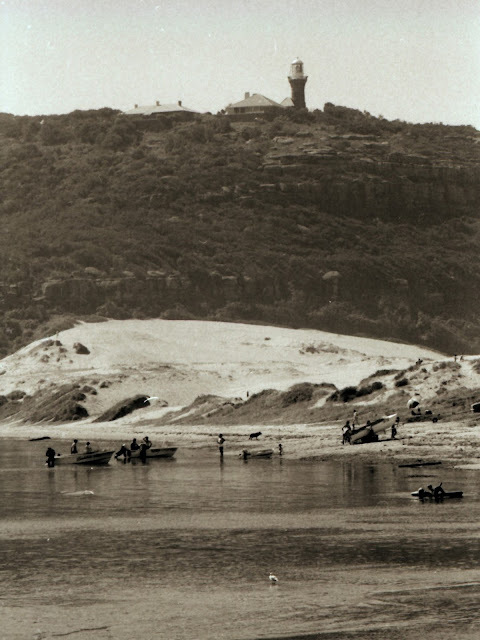 The bite may have been in the Port Stephens area about 1960. Serious-enough injury - to lower section of his body. The 2nd 'bad-luck' storywas a fatality. A Blue-Ring octopus bite. The diver carelessly and unknowing of the danger allowed the tiny octopus to crawl over his bare back and was nipped on this spine. Paralyzed soon after- his breathing became impossible (which is how the venom kills). This may have been the first B.R.O. fatality. 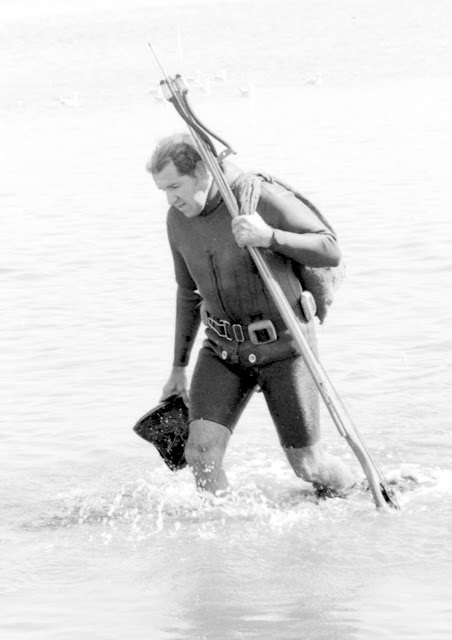 The White Water Wanderers had pioneer divers with a few younger guys like 'Buck' Cain, and Mark Lee. 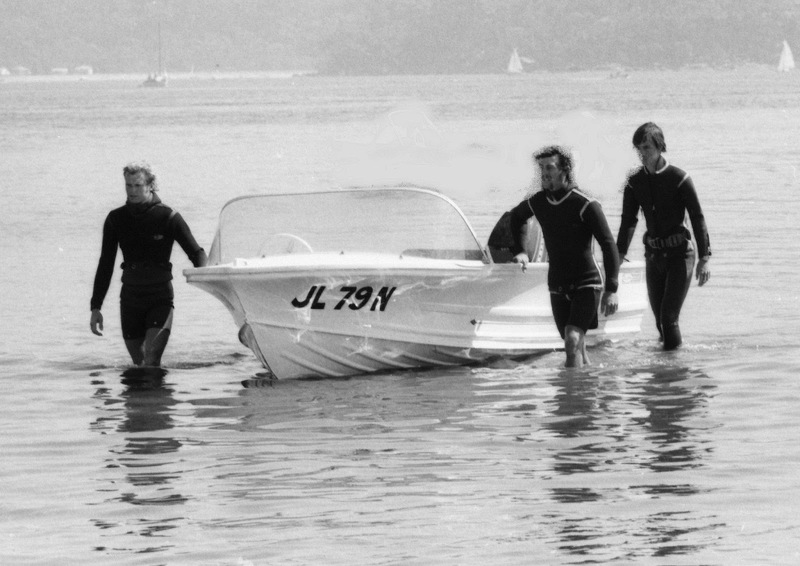 Mark perished in a high speed power boat accident in the 1990s. 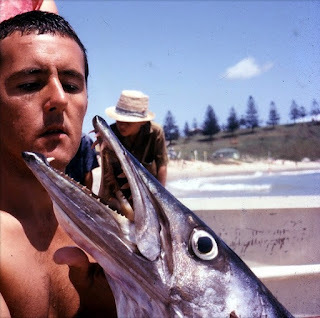 Buck Cain, shown in one of Ron Taylor's documentaries is the guy who spears a large Venus Tusk fish (aka Blue parrot) - loses it and thrusts the spear clean -through the centre of the fish to stop it swimming away. See this in "Ron Taylor's SKINDIVING PARADISE" on You Tube. 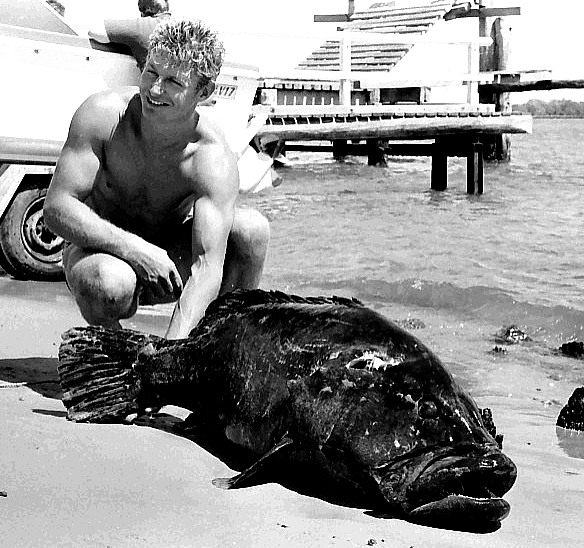 Skindiving Paradise, for obvious reasons (it was made for the Queensland Government Tourist Bureau) did not show Wally Gibbins and the 11 foot Tiger shark, although spear fishing was strongly featured as this was 1963 and spearing was relatively new on film. Taylor used Kodachrome film - long lasting colors being an asset of the film type, whereas commercial (or professional) film stock was later found to eventually fade to pink. This makes the ten minute documentary very unique today with very nice quality. 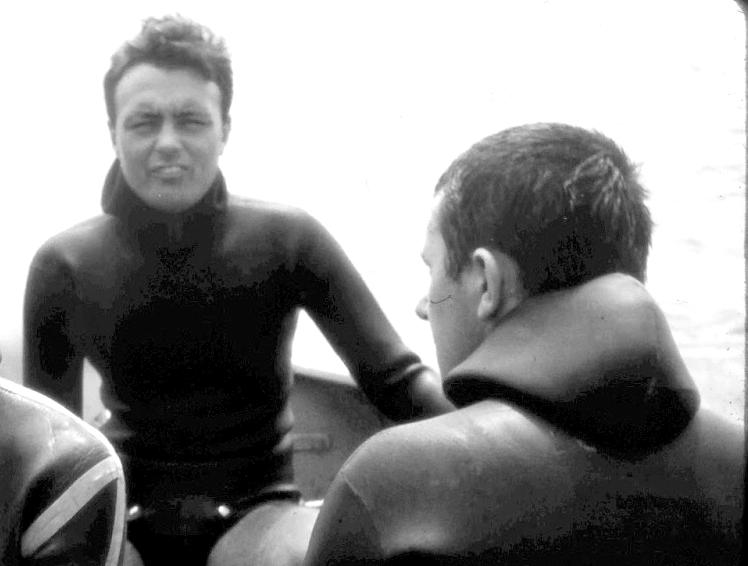 John Gallagher was spooked by the Tiger at Sykes Reef and called to Wally partially for help and to see how the then almost legendary diver would handle things. Wally didn't delay in testing his anti-shark device. They towed the large Tiger back to Heron where it was 'still kicking' an hour later. Gallagher and others took film footage, but not Ron Taylor who showed up later. 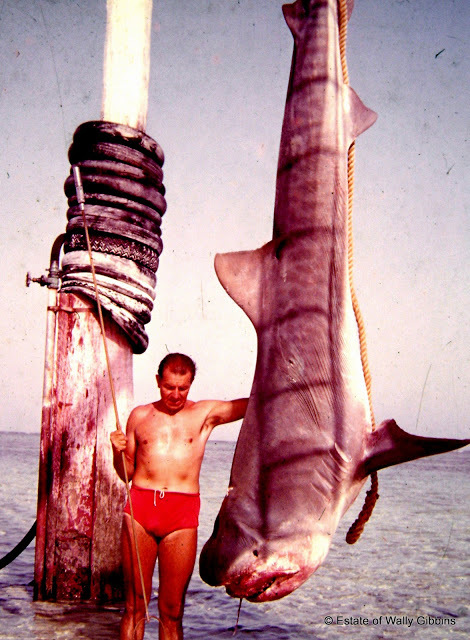 Wally Gibbins (St.George Sea Dragons club) at Heron Island (1963) with 'his' Tiger shark. 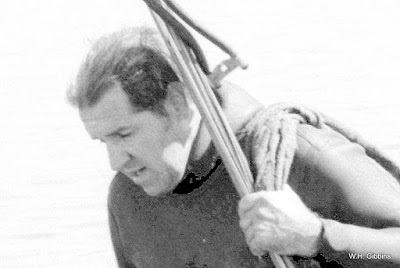 Below, Vic Ley at South West Rock (1969).Black Cod from Fish Rock. Wreck diving film - divers using Aqua Lung scuba. 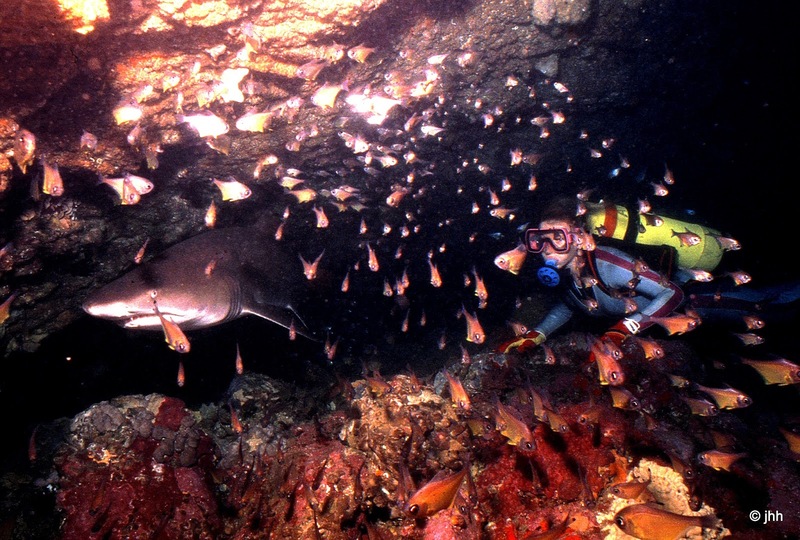 Grey Nurse sharks follow their live food supply - then 'vanish' to unknown destinations of their choice. This is often mistaken as their population declining. 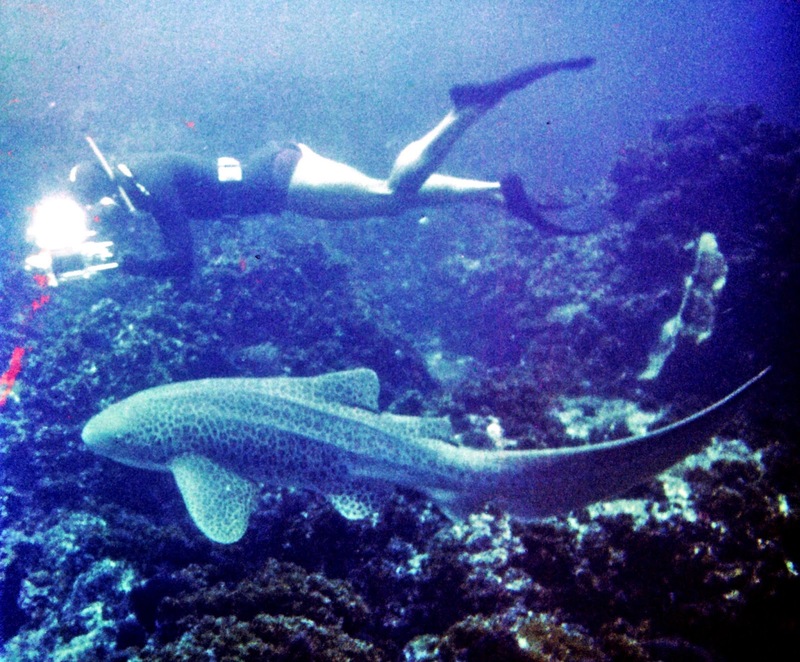 The Vanishing Grey Nurse Shark - How Ben Cropp saw the subject in (circa) 2007. Ben Cropp AM reports on the situation in (circa) 2007 when it was believed the population was in peril. Dive sites visited and known for GNS are Wolf Rock, Flat Rock, Big Seal Rock and 'Magic Point'. The since outdated tagging system of drilling holes through both dorsal fins to attach plastic livestock-style ear tags is shown. The best material is the final ten minutes. 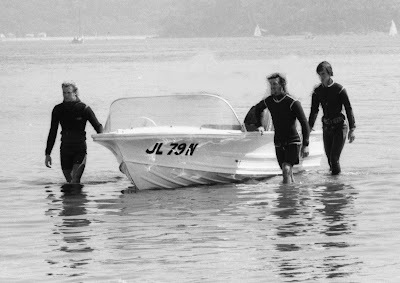 There is an interview with a former professional fisherman (Bernie) at Seal Rocks beach who explains how 300 divers in any one day of a weekend had to have been spooking sharks during the late 1980s. 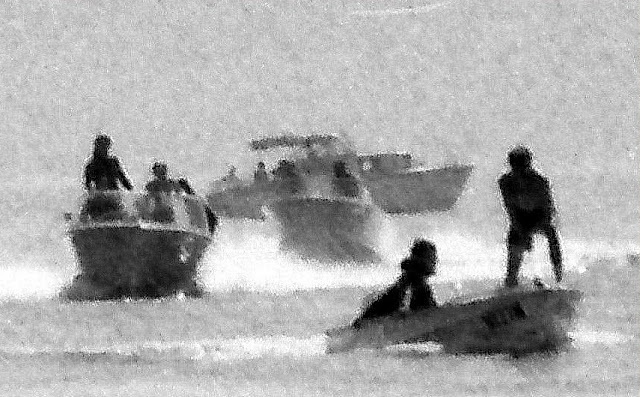 In retrospect (2016) it's no wonder the Grey Nurse were vanishing - they were going elsewhere to avoid scuba divers. Plus the set lines catching them, also at Seal Rocks by another pro fisherman.